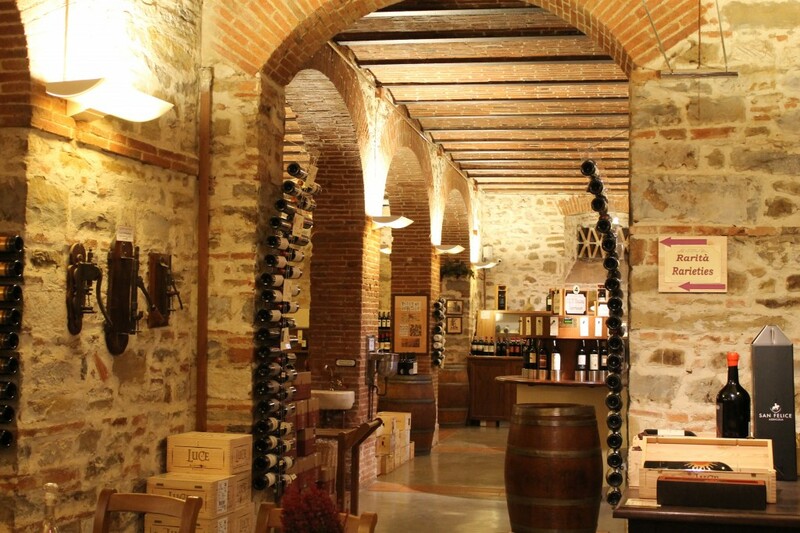 Le Cantine, located in Greve in Chianti, boasts that it is the largest enoteca in Tuscany. It’s very easy to believe this claim – you walk down a set of stairs into the tasting area and find yourself surrounded by what seems like an unlimited amount of wine tasting machines. This was a perfect way for Ryan and I to spend our morning in Greve in Chianti (we took a half day trip from Florence – more on this later). It’s not the personal experience you’d receive at some places, but it worked for us! You purchase a card with a certain amount of money on it (we paid for 25 euros on our card) and decide which wines to taste. 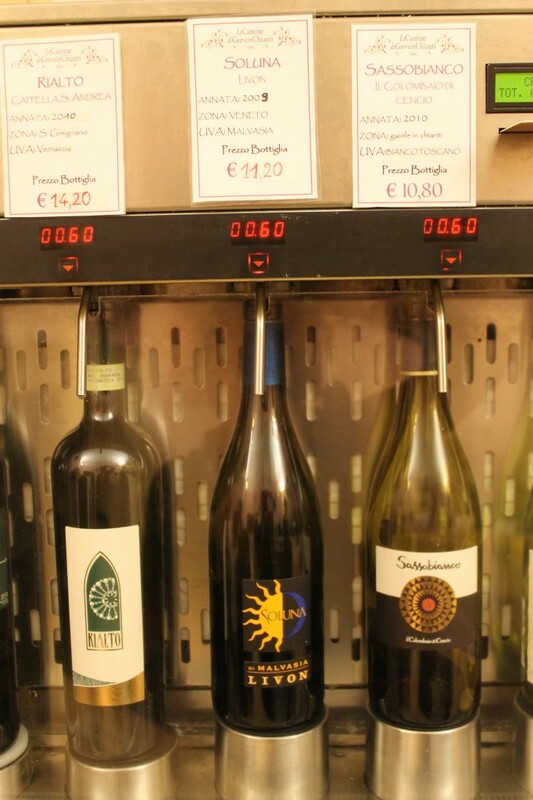 The underground enoteca has mechanical wine dispensers. You simply find a wine you wish to taste, stick your card in the slot, place your glass under the appropriate spout, and press the button for the corresponding wine. Each taste has a price clearly marked above the bottle. The prices started at 0.60 euros and go up from there. Ryan and I generally tasted wines between 0.60 and 1.20 euros, which allowed us to sample plenty of different wines. 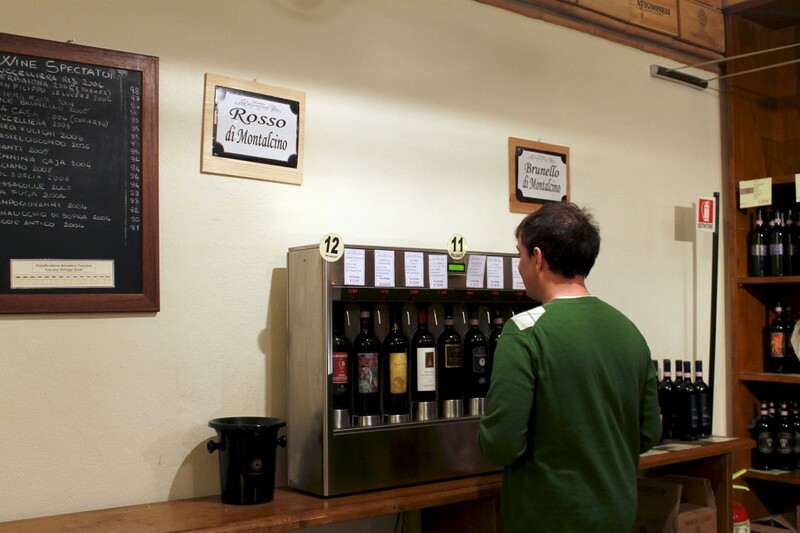 A close-up view of the wine dispenser machines. We love tasting wines and learning about what we’re drinking. Le Cantine has a supply of wine guides available in several languages which provide an explanation of the different wines available to taste. 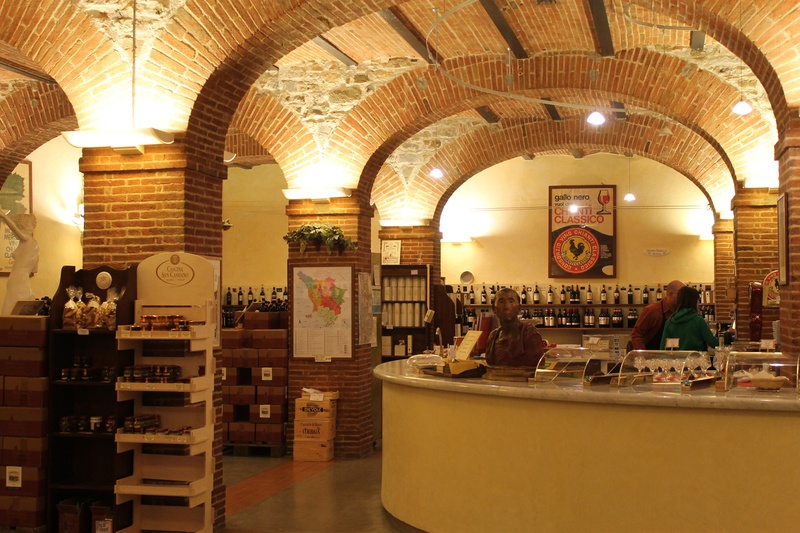 Since we were heading to Montepulciano right after Florence, we were interested in the famous wine of that region – Vino Nobile di Montepulciano. Vino Nobile di Montepulciano is always made up of at least 70% of a Sangiovese grape clone, called Prugnolo Gentile, which is used exclusively for this wine. The remaining 30% is generally made up of Canaiolo, Merlot, and/or Cabernet Sauvignon. In general, I preferred the mix of Sangiovese and Canaiolo. We also tasted several Chianti Classico wines, which are also made up of mostly the Sangiovese grape (at least 80%). Both the Vino Nobile di Montepulciano and Chianti Classico are D.O.C.G. wines, which certifies that the wines are made within a certain region using specific methods and are tasted for quality by the government (bottles are marked with a pink label across the top). The majority of the wines offered at Le Cantine are red, but there are also some white wines and sparkling wines to choose from, as well as Vin Santo (dessert wine) and grappa. In addition to wine, olive oil tastings are offered through the same style of dispensing machines. And best of all – they are free to taste! There is also free salami provided at the front counter (shown in the first picture), along with other foods available for purchase. If you have a limited amount of time in Greve in Chianti and wish to taste several wines of the region, Le Cantine is a must! It won’t be the same experience as touring a winery of the area, but it will provide a lot of wine and information. It’s open from 10am-7pm, daily (check the website for any holdiay closures) and is located between the Piazza Trento bus stop and the main piazza in Greve in Chianti. This entry was posted in Travel and tagged experience, Greve in Chianti, Italy, wine tasting by Kristin. Bookmark the permalink.